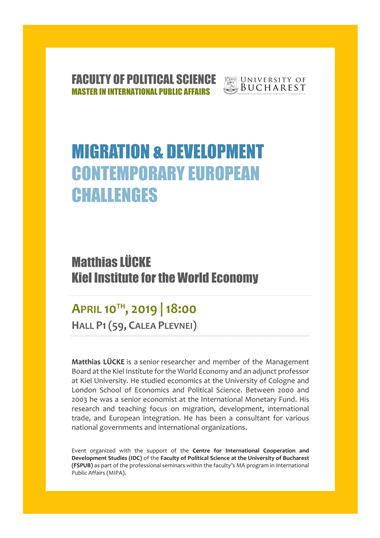 Matthias LÜCKE is a senior researcher and member of the Management Board at the Kiel Institute for the World Economy and an adjunct professor at Kiel University. He studied economics at the University of Cologne and London School of Economics and Political Science. Between 2000 and 2003 he was a senior economist at the International Monetary Fund. His research and teaching focus on migration, development, international trade, and European integration. He has been a consultant for various national governments and international organizations. Event organized with the support of the Centre for International Cooperation and Development Studies (IDC) of the Faculty of Political Science at the University of Bucharest (FSPUB) as part of the professional seminars within the faculty’s MA program in International Public Affairs (MIPA).